A successful recycling program in Penn Township is truly a community-wide effort. Residents and the business community can pitch in to improve our recycling rate, reduce the amount of trash generated, and increase the grant funding that the Township receives. 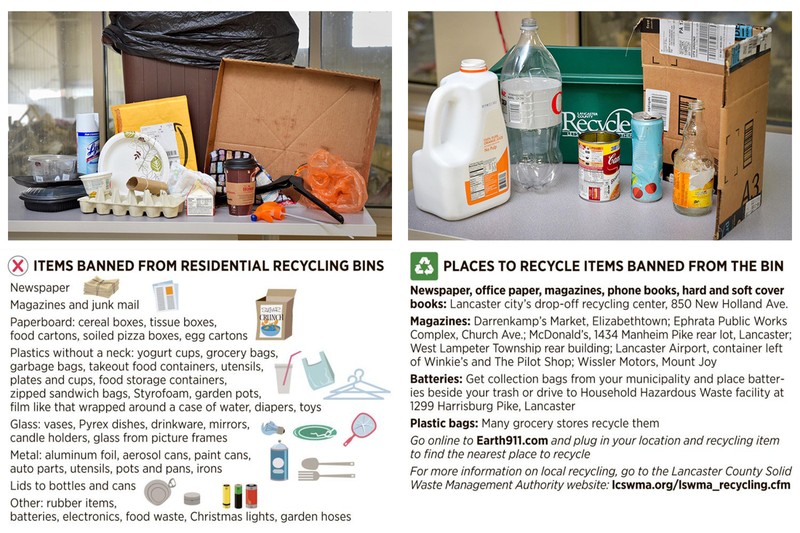 The Resident’s Guide to Recycling & Solid Waste Disposal in Lancaster County is a great resource from the Lancaster County Solid Waste Management Authority. It has been recently updated to reflect the Authority’s expanded list of e-waste items accepted for free at their Household Hazardous Waste Facility. Items to be recycled in the weekly recycle bin include: corrugated cardboard, plastic bottles & jugs with necks, metal food & beverage cans, glass jars & bottles. Items not permitted in the green recycle bin may still be recycled. Mennonite Central Committee’s (MCC) Material Resource Center (MRC) in Ephrata and Lancaster City’s recycle center in Lancaster accept office paper, cardboard, magazines, newspapers, phone books, etc. Thanks to Good’s Disposal Service and PPL Electric Utilities, Penn Township residents can drop off cardboard and CFLs for recycling. CFLs can be brought in the office and dropped off in a box in the lobby. Look for the sign and the green dumpster in the parking lot to put your flattened cardboard in. Please – no other assorted paper or trash, so help us keep this service alive by respecting these rules. They are provided by these community partners with no cost to the public. A practical way to cut down on the amount of trash you send to the landfill is by composting – right in your backyard. Scraps from fruits and vegetables, leaves, grass clippings, sawdust, and even shredded newspaper can all be put into your compost bin and removed from the waste stream. And the result from your composting efforts is good, nutrient-rich soil that can be used to boost the growing potential in flower beds and vegetable gardens. The U.S. Environmental Protection Agency (EPA) and Lancaster County Solid Waste Management Authority have provided guides about how composting works and how you can make your own compost bins to do it at home. Recycling is one of the best ways for you to have a positive impact on the world in which we live. Recycling is important to both the natural environment and us. The majority of people site “it’s the right thing to do,” “saving natural resources,” “improving the environment” and “saving landfill space” as reasons to recycle. Not only is recycling a morally right thing to do, it’s also financially smart. Economically speaking, using recycled materials is more cost effective and produces jobs. Huge amounts of energy are used when making products from raw materials. Recycling requires much less energy and therefore helps to preserve natural resources. Waste or rubbish that could be recycled and isn’t also pollutes the air we breathe, the fish and other living things in our waterways, pollutes our water and harms the deer and wildlife in our world. The U.S. Environmental Protection Agency (EPA) led the way with its publication on sustainable materials management. Some states, like Oregon and Maryland, have adopted this plan and are taking steps to become part of the solution to creating a safer and healthier world. Let’s start taking a closer look at the purpose of recycling. Let’s put more emphasis on protecting the environment and less on who can set the highest recycling goals. Let’s figure out what recycling can realistically achieve and how. Then, let’s go out and do it. Grasscycling and composting are two techniques residents can use to reduce waste disposal and possible water contamination as well as save time, money and energy while returning valuable nutrients back into lawns and gardens. Grass clippings are mostly water and nitrogen. They decompose into the grass quickly and return nutrients to the lawn which will result in a greener, healthier lawn. Chemicals, such as pesticides, herbicides and insecticides, stay on the lawn to do the intended job. Grasscycling saves money by reducing gas consumption, lawn bags and fertilizer. By returning clippings to the lawn regularly, you can reduce fertilizer use by one application per season. Grasscycling does not require the use of lawn bags because the clippings are not being picked up. With no clippings to bag, less frequent stopping and starting of the lawnmower saves gas and mowing time and reduces air pollution. Grasscycling must be done correctly to eliminate water pollution. Clippings should be directed back to the lawn. This is especially important when using a side discharge mower. If clippings are left on driveways, sidewalks or other impervious surfaces, they can end up in surface water or drains. These clips will add nutrients to surface water and increase the growth of algae and other aquatic plants that can deplete oxygen in surface waters. All mower types can be used successfully for grasscycling. To prevent clumps or discharge onto impervious surfaces when using a side discharge mower, mow toward the center of the lawn toward the discharged clippings to re-cut and distribute over the lawn. This will prevent “windrows” from forming on the lawn. Most rear bag mowers have a flap that covers the discharge shoot when the bag is removed. This allows the clippings to drop right down onto the grass. Mulching mowers pull the clips up into the mower so they can be re-cut into smaller pieces before depositing them on the lawn. Any clips that blow from under the mower onto sidewalks or driveways should be swept or blown back onto the lawn. When you can’t leave the clips on the lawn, collect grass clippings for use as mulch. Use clippings in a thin (0.5-inch to 1-inch) layer around annual and perennial plantings. Remove all weeds before applying mulch. Grass clippings also can be mixed with shredded leaves and spread around plants. The LCSWMA website contains information about recycling, its free household hazardous waste disposal drop-off, waste-to-energy, and more. Click here to view one persons story on recycling. Read more about the Covered Device Recycling Act and how it affects disposal of old televisions, computer monitors, laptops, etc.